Blog Israël in de media: Time Magazine: geeft Israel nog om vrede? Een foto kan beter liegen dan 1.000 woorden. Daarvoor hoeft hij zelfs niet gemanipuleerd te worden. Je drukt wat foto's af van zonnende Israeli's op het strand om te onderstrepen dat vrede met de Arabieren - of de Palestijnse onderdrukking en bezetting überhaupt - ze koud laat. Je kunt even makkelijk foto's plaatsen van zonnende Palestijnen in Gaza (al gaat zonnen lastig met een burka) en zwemmende en vliegerende kinderen in Ramallah, om aan te duiden dat het best prettig verpozen is onder de Israelische bezetting c.q. blokkade en onder het islamitische Hamas- c.q. corrupte Fatah-bewind, en dat de vredesbesprekingen ook de Palestijnen koud laat. Citaat via Elder of Zyon: Meanwhile, Abbas himself said "[i]n the West Bank we have a good reality . . . the people are living a normal life." Time cover story claims decadent Israelis no longer care about peace. As Israel launches a new round of peace talks with the Palestinians, media outlets are bending over backwards to find a new angle on the peace process. One of the most shocking comes from Time magazine, whose cover story "Why Israel Doesn't Care About Peace" suggests that Israelis no longer see peace as a priority because the economy is strong and the country has largely been free of terror inside the green line. Polls repeatedly show that Israelis strongly support a two-state solution to the conflict. But it may, indeed, be true that Israelis have grown skeptical of any breakthroughs with the Palestinian leadership now divided between Fatah in the West Bank and Hamas in control of Gaza. Israelis have seen that new peace talks are usually accompanied by new terror attacks. The Time article, written by Karl Vick, however, glosses over any legitimate reasons why Israelis may have lost interest in the details of the peace process, instead presenting Israelis as callous, insensitive, and decadently more concerned with beaches, water sports, and Tel Aviv's cafe culture than with matters of real substance. The reference to the "blood feud with the Arabs whose families used to live on this land" is particularly telling. Vick appears to subtly reject Israel's historic claims to the land and to imply that Israelis are at fault in the conflict, since the land really belongs to the Arabs. The print edition's accompanying photos reinforce Vick's contention that Israelis are preoccupied with leisure. The images feature Israelis lying on the beach, chatting at a cafe, or sitting on park benches. The implication is obvious: Israelis don't care about peace because they are doing fine without it. Thus, Time distorts Israeli resilience in the face of a decade of rocket attacks and terrorism into an image of decadence. Perhaps the real reason Israelis have become apathetic to the peace process (not peace itself, as the cover suggests), is because of the way the world quickly forgets Israel's numerous peace moves  Ehud Barak's offer of a state at Camp David, Ariel Sharon's withdrawal from Gaza, Binyamin Netanyahu's settlement freeze. Yet the media blames Israel for years of stalemate. While there have been no parallel moves from the Palestinians to advance the peace process, only ever-increasing demands on Israel, Vick gives the impression that the Palestinians have been doing everything they can to make peace possible. In the West Bank, the territory administered by Mahmoud Abbas, President of the Palestinian National Authority, technocratic Prime Minister Salam Fayyad is taking a serious stab at governance, starting by professionalizing security forces. Even before the shooting deaths of four Jewish settlers by Hamas operatives on Aug. 31, the worst such incident since March 2008, Fayyad's security forces had arrested more than 300 Hamas supporters in dread of an attack like that. "Jewish settlers" - not Talya and Yitzchak Imes, Kochava Even-Haim, and Avishai Shendler, not civilians, not even "Israelis" - were killed by people Time labels as "Hamas operatives" while Fayyad sat "in dread" of such activity. If Fayyad's dread is what demonstrates Palestinian concern for peace after one year of rejecting Israeli offers for peace talks, what does Time have to say about Palestinian leaders beyond Fayyad? A few days before leaving for Washington, chief Palestinian negotiator looked into a camera. "Shalom to you in Israel," he said. "I know we have disappointed you." In a bold, not to say desperate, bid to rouse ordinary Israelis, seven senior Palestinian officials addressed themselves to Israel directly in online videos. Each clip concludes with the words "I am your partner. Are you mine?" While some may see Erekat's comments and the Palestinian videos as political propaganda that gives no insight into the minds of the Palestinian people, for Vick it serves as a counterpoint to Israel's apparent apathy. Of course, he has to bend over backwards to make the point. As a result, we have another cover story on newsstands worldwide accusing Israel of not caring about peace. 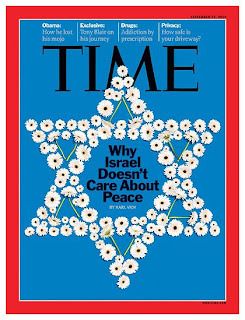 What we really learn, however, is that Time magazine doesn't care about Israel.